CelluliteRx® products are formulated with all natural ingredients and fresh beautiful scents. 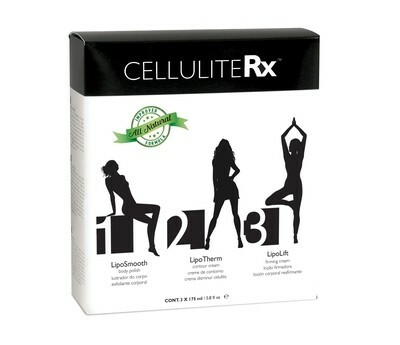 CelluliteRx® recognized worldwide as the #1 cellulite treatment! Your cellulite-free lifestyle starts with CelluliteRx®! The patented delivery system, QuSomes™, improves penetration of fat burning, phyto-hormone, anti-inflammatories and antioxidants to treat cellulite at a cellular level and slim in 4 weeks. Apply a small amount to wet palms or a loofah and massage onto each area in upward circular motions. Rinse thoroughly. For best results, LipoTherm Contour Cream. Apply 1/4 teaspoon to each area of the body where treatment for cellulite and slimming is desired and massage into the skin for approximately 1 to 2 minutes. It is normal to experience an immediate rosy flush after application, indicating increased circulation. For best results, follow with LipoLift. Can be used as Step 3 in the CelluliteRx system or alone to treat sagging skin in the neck area, knees, abdomen or any other areas of the body where skin firming is desired. There are three seperate products in the Institut' DERMed Cellulite Rx Treatment Kit that help to slim and reduce the appearance of cellulite in 4 weeks with once daily application. Sea Mineral Algae Extract -enhances micro-circulation andretains the skin’s moisture barrier. Walnut Shell, a natural exfoliant that eliminates dead skin cells, refines skin structure, and restores skin elasticity. Apricot Seed a gentle, natural exfoliant that effectively softens andhydrates skin. Sweet Almond Oil a moisturizer that enriches the skin with vitamins E and B, promoting a youthful appearance to the body. Wild Yam Extract a phytonutrient that blocks formation of new adipocytes (fat cells) caused by estrogen in the subcutaneous fat layer of the skin. Niacin a powerful vasodilator that increases circulation and detoxification where applied indicated by a warm, rosy flush to the skin. Regu-Slim® a patented formulation of guarana seed extract, caffeine, carnitine, and maltodextrin that has been clinically proven to drastically reduce adipose (fat) tissue Alpha Palmitoly Petide-21™ infused with ultra-pure anti-inflammatory botanicals millet seed, borage, and rosemary extracts. Liposome transdermal delivery system that encapsulates active ingredients increasing deeper penetration into the layers the skin where cellulite forms. Glycolic Acid accelerates the skin’s cellular renewal process improving skin tone. Alpha Copper Tripeptide-4™ and Acetyl Alpha-Tetrapeptide-5™ infused with ultra-pure antioxidant botanicals (pomegranate, rose hips, rosemary extracts) supports skin collagen regeneration for improved elasticity and firmness.